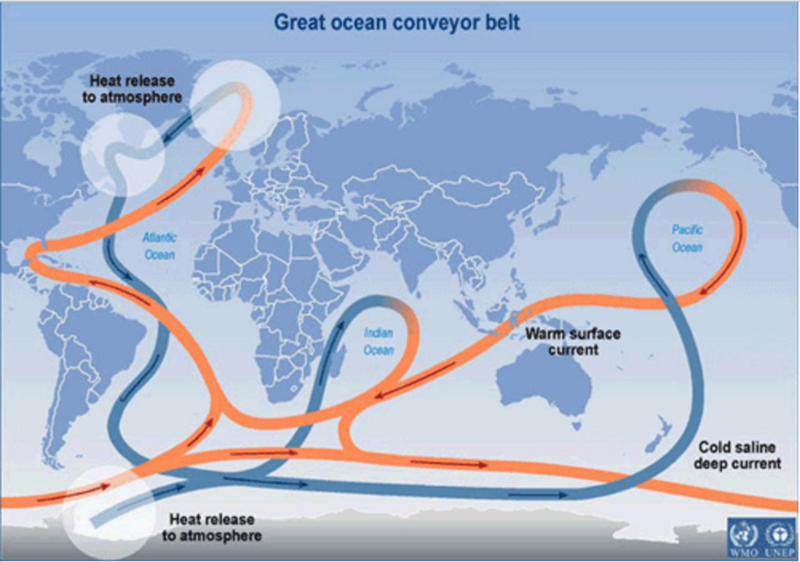 What is the role of the oceans in Global Warming/Climate Change? There has been much press and controversy in recent years about global warming or climate change. Opinions range from doomsday scenarios to absolute disbelief. As a meteorologist (not climatologist), I say that the truth is somewhere in between these extremes. Although climatologists and meteorologists debate the merits of global climate change theory, there are some facts that are not disputed by scientists. The vast majority of scientists agree that the global surface temperatures have increased since the mid-1800s and that humans are adding CO2 to the atmosphere. They also agree that CO2 and other greenhouse gases have a warming effect on the planet. There is some disagreement, however, on the IPCC claim that there is a 95% certainty that the warming since 1950 has been primarily caused by human activities and just how much the planet will warm during the 21st century. They also tend to argue whether the warming is dangerous and whether or not anything can or should be done to prevent this. Just what are greenhouse gases anyway? 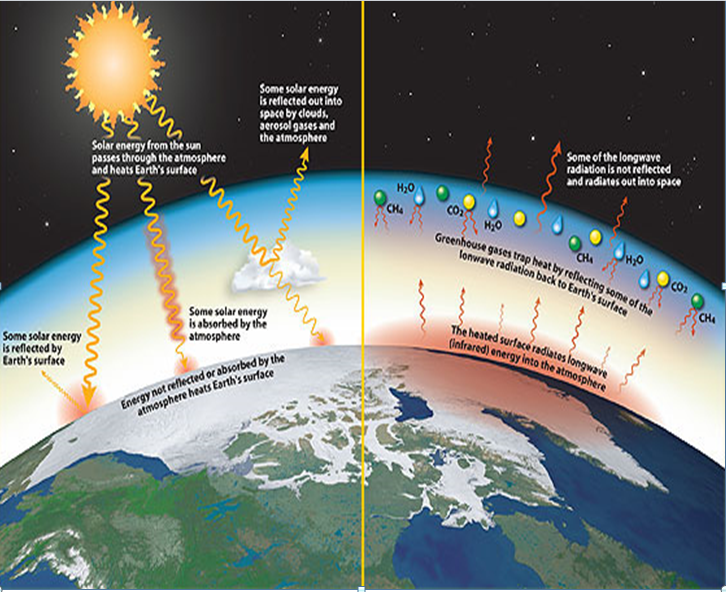 Greenhouse gasses are those gases that allow the atmosphere to retain heat and thus warm the earth’s surface above what it would be from sunlight alone. The most significant greenhouse gas is water vapor followed by CO2, methane, nitrous oxide and ozone. Sunlight heats the earth’s surface and that heat is then partially absorbed by greenhouse gases. Without these greenhouse gases the earth’s temperature would be about 33°C (59ºF) colder than it is now, and our world would likely be a giant snow ball. The issue today is that some of these greenhouse gases, particularly carbon dioxide and methane have been increasing steadily since the beginning of the industrial revolution. 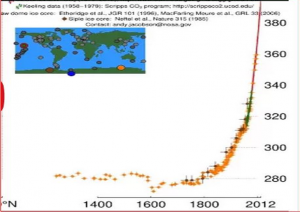 Over the past approximately 150 years the level of carbon dioxide, for example, has undergone a very significant increase of about 40 percent, which cannot be accounted for by natural sources alone. Carbon dioxide is a powerful greenhouse gas, however, it is present in our atmosphere in very small quantities, about 400 parts per million or 0.04%. Estimates of CO2’s contribution to the greenhouse effect vary between 9% (3C) to as much as 26% (8.6C) of the total 33C effect. Given that atmospheric CO2 has increased about 40% over the past 150 years then you might well expect some warming. Just how much warming is what is in dispute and the best estimates I can find is that doubling CO2 would result in a warming of 0.7C to 1.2C alone or about 0.3C to 0.5C at the current 40% increase level. Add in various feedbacks and you might double that number. The oldest instrumental temperature record comes from Central England and goes back to the 1600s. 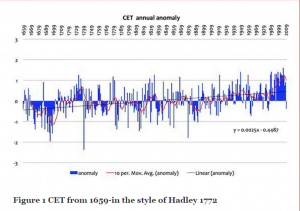 In that record there is a sharp warming from 1690 to 1740 and another from 1820 to 1840. 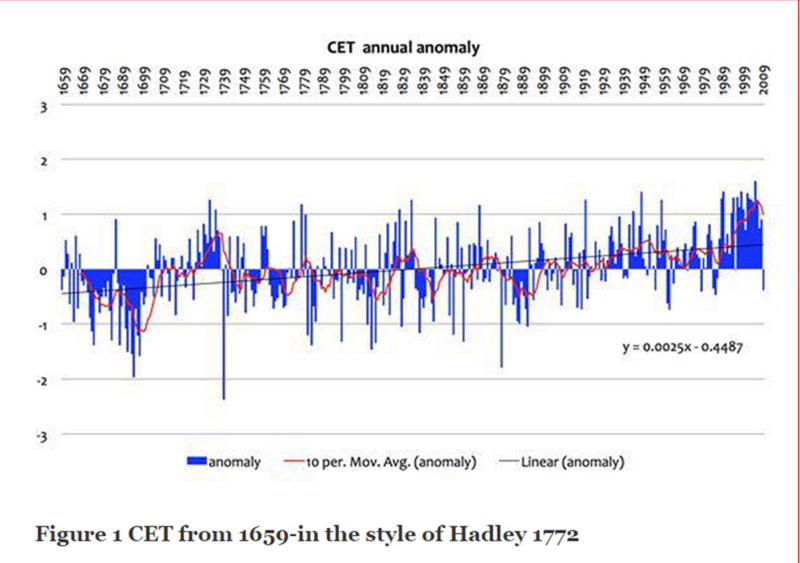 Although we can’t infer too much from this about global temperature variations, the Central England temperature record does illustrate the magnitude of natural climate variability. Solar activity also varies over time which affects global temperatures. From about 1750-1950 total solar irradiation has been estimated to have increased by about 1 to 1.5 Watts per square meter which can account for 0.2C to 0.3C warming during that 200 year period. More recently, total solar irradiation has begun to slowly decrease. Since 1998 there appears to be a pause in global warming not explained by the global climate models as they all predicted a 0.2C per decade warming. Are the models too sensitive to CO2 or is the treatment of natural variability not modeled well? Some papers suggest that the pause is not really there, however, the satellite data and the Nation Centers for Environmental Prediction (NCEP) 2 meter temperature data strongly suggest that it is. In the most recent (2013) IPCC report it states that “Warming of the climate system is unequivocal, and since the 1950s, many of the observed changes are unprecedented over decades to millennia. The atmosphere and ocean have warmed, the amounts of snow and ice have diminished, sea level has risen, and the concentrations of greenhouse gases have increased“. 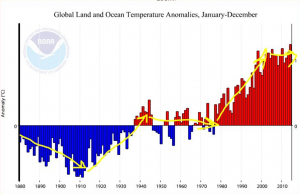 If this is true, we might then ask what caused the strong warming noted from about 1910 to about 1945? This warming seems very similar to the more recent run-up from the late 1970s to 1998 but occurring prior to the 1950s. 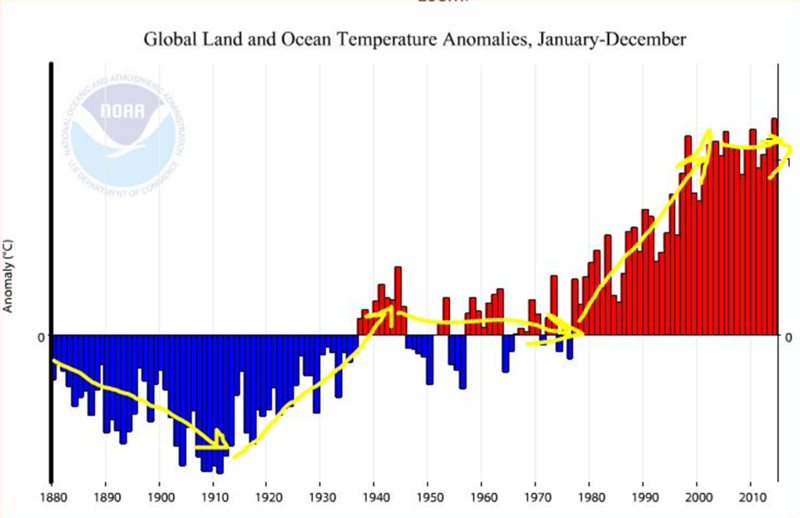 In the chart below, you will note that the global temperatures were falling from before 1880 until 1910 and then there were two periods when temperatures were nearly steady or fell slightly. The first pause occurred from the mid-1940s until the late 1970s then starting again from about 1998 until today. The most recent IPCC report, in my opinion, does NOT have a convincing explanation for the large warming between 1910 and 1945, the cooling between 1945 and 1975, and the flat temperatures in the 21st century. This suggests to me that there is more in play here than just CO2, since the earlier warming occurred prior to when the majority of CO2 was emitted. Another theory offered by Dr. William Gray suggests that the ocean has multi-decadal and multi-century cycles that may have a significant influence on global warming. Below you see a similar trend with the ocean temperatures. The total heat content of the oceans is enormous when compared to the atmosphere. The atmosphere contains only about 2% of earth’s heat, the land masses another 2% and the oceans, about 93% with the remainder locked up in ice. Given the above, one must ask just what role the oceans play in global warming? The ocean-atmospheric interactions are not fully understood and given that the vast majority of earth’s heat is stored in the oceans it is vital to any predictions regarding global warming to understand those interactions. One of the key questions is how much mixing of cold deep ocean water with warmer surface water varies over time and how does that effect the global temperature. One key ocean cycle that is well documented is the Pacific Decadal Osculation (PDO). The PDO is a warming and cooling of the Pacific Ocean over a time period of 2-3 decades. If you plot the PDO index (see above) you will see that the two periods of strong warming (1910 – 1945) and (1978 – 1998) corresponds well with the positive (warm) PDO while the two periods of no global warming or some cooling corresponds well with the periods of negative PDO. The theory that global warming is driven by ocean cycles seems to have some validity. Increasing atmospheric CO2 does have a role here, however, the longer-term ocean cycles may have an equal or possibly stronger effect. 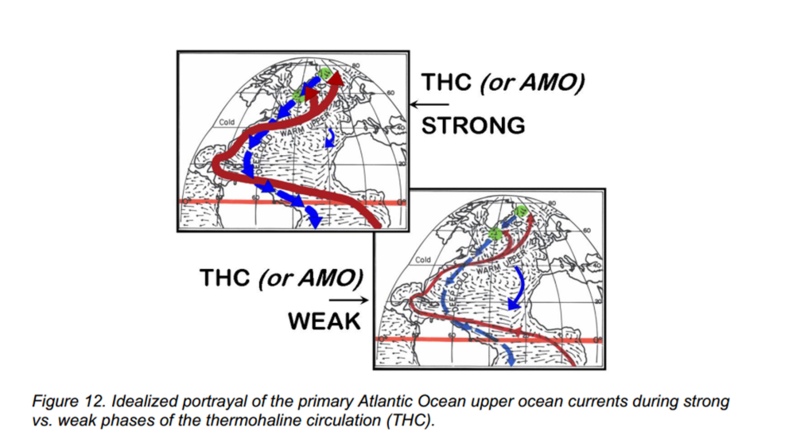 Besides the multi-decadal ocean cycles like the PDO, it is theorized that the Thermohaline Circulation (the global ocean current conveyor belt) runs in cycles that can extend out 100 years or more. As this circulation increases you get more mixing and thus colder sea surface temperatures in the tropical regions and warmer near the poles, however, if slows down you get less mixing and therefore warmer sea surface temperatures in the tropical regions but cooler SST in Polar regions. How could greenhouse gases warm the oceans? 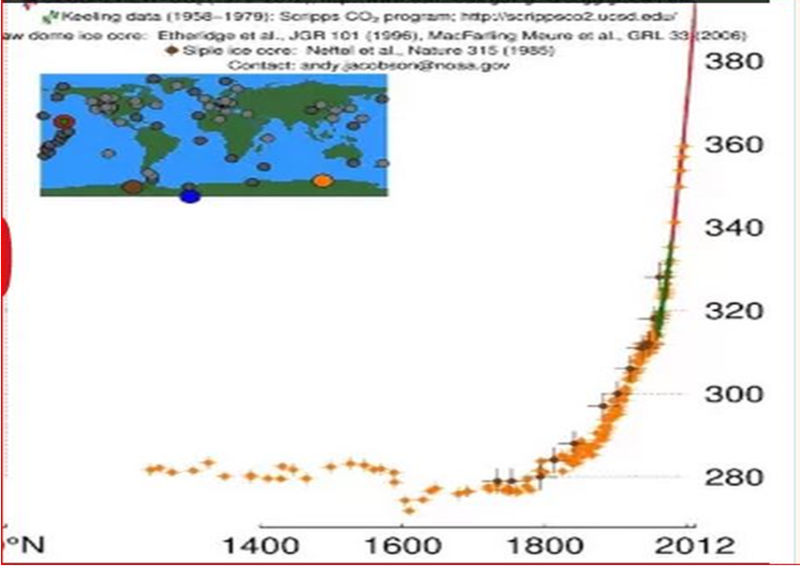 The downward radiative forcing at the earth’s surface due to increasing CO2 levels is estimated to be about 0.4 W/m2. 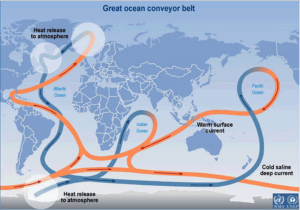 The oceans, on average, are warmer than the atmosphere so the net energy flux across the ocean/atmosphere interface carries heat from the ocean to the air. Given this and the fact that downward infrared energy cannot penetrate the surface of the ocean more than a few microns how then can back radiation warm the oceans? The current theory suggests that the downward infrared radiation heats the very thin skin layer of ocean which has the effect of reducing the flow of heat from the ocean to the air, thus allowing the oceans to retain heat over time. Detractors of this theory point out that the increase in skin temperature would increase evaporation rates and thus tend to cool the skin surface largely nullifying any warming effect. The spike in global temperature for 2014-2015 reflects, in part, a brief return to the positive PDO in late 2013 and as we return to a negative PDO in the coming years the current pause in warming will continue. By 2020 we may have a better idea on how much ocean cycles play in atmospheric warming. This entry was posted in Climate Change, Meteorology and tagged Climate Change, Global Warming, Ocean Weather. Bookmark the permalink. 6 Responses to What is the role of the oceans in Global Warming/Climate Change? I am a Meteorologist in Ghana with GMet for more than two decades now. I went through your write up and followed it very well. According to you, the IPCC did not explain some features on the global Temp graph. I also have some explanation which might be answers to those challenges. I will like you to reply this mail so that we can continue with this findings. Thanks for your comment. Please feel free to submit additional comments on this subject. I am not trying to condemn your opinion but I just want us to look at Global warming from another point of view through volcanic eruptions and earth temperatures. From the geological point of view, it looks like there is some amount of heat stored in the center of the earth which leads to eruption of volcanoes. Since the ocean is in direct contact with the earth this heating will be manifested very well in the ocean temperatures and it will look like it is the ocean which is generating that kind of heat manifested in the atmosphere which we term as global warming. Well, I don’t know how this heat that leads to the volcanic eruption be measured but I thought of doing a project, using earth temperatures to see if it will have some kind of correlation. I looked at this site, ‘ http://volcano.si.edu/search_eruption_results.cfm ‘ and looked at confirmed volcanic eruptions in Cameroon. When I compared the dates of the eruptions with the ‘Global Land and Ocean Temperature Anomalies, January – December’ that you posted , I realized that there were no eruptions from 1880, when temperatures were dropping until 1909 when an eruption occurred and then temperatures started rising. Also, during the early part of the pulse, between 1940 and 1950 there were no eruptions but with just few in 1954 and in 1959. But during the second rise in the temperature anomalies, there were close events of eruption 1982, 1989, 1999 and 2000. Since the year 2000 when the second pulse was realized in the anomalies there were no eruptions again. To my opinion, it could happen that the heating in the earth’s crust has a kind of cycle which is easily manifested in the ocean temperatures and in turn affects atmospheric temperatures. I will be pleased if I could get your email so that we can communicate more and share ideas on the weather because if I fail to visit this site then I will lose contact with you. What about the 1883 eruption of Krakatoa in the Dutch East Indies? It’s been a while I checked on this site. Thank you very much for your reply to my post. I have seen a lot of your posts which even reminded me of our conversation. In fact, I could not get the record of volcanic eruption from Krakatoa from the site I sent to you, but that is just by the way. It has been a lot of thinking to me, as a meteorologist who is much concerned about ‘climate change’. Fred, if this is true then can we find out from NASA or the appropriate source, those who studied the sun if actually the sun is growing in size and if that is what is causing the warming of both the atmosphere and the oceans. Solar activity varies over time and from about 1750-1950 total solar irradiation has been estimated to have increased by about 1 to 1.5 Watts per square meter. This may account for 0.2C to 0.3C warming during that 200 year period.